In order to raise public awareness on Dyslexia, Biology Department will be organizing a series of activities with Persatuan Dyslexia Malaysia Kuantan. One of the activities is to set up a mini library. 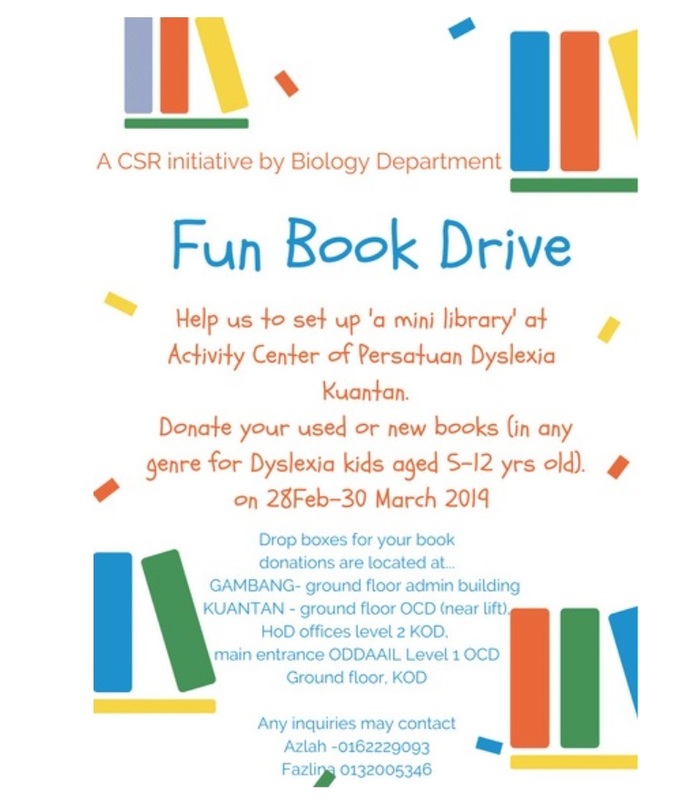 Therefore, we would like to seek your kindness to donate used or new books for leisure reading of Dyslexia kids aged 5-12 yrs old. The mini library also can be benefitted by parents while waiting for their children who participate in any activity. You may drop your books into drop boxes located at admin building of Gambang Campus, ground floor OCD (near lift), HoD offices level 2 KOD and main entrance ODDAAIL Level 1 OCD, starting from 28 Feb until 29 March 2019.